KA-BAR Last Ditch Neck Knife | BUDK.com - Knives & Swords At The Lowest Prices! With an overall profile no larger than a credit card, this knife can be concealed just about anywhere. Lace it up in your boots, pin it under a tactical vest strap, or use the enclosed cord to hang it around your neck. I've been carrying this knife daily for about three years now. I don't have a single complaint. You can't go wrong for the price. Excellent Little Knife This little knife is just awesome. The edge is very sharp. So small it can be worn inside a 5th pocket on your jeans or hidden anyware as a backup...Very, very nice knife. XD ok... Here's the deal. I gave this knife to my girlfriend because it was too small for my hand... When I did it kept falling out of the sheath and poking her... A for effort I guess, but not for effectiveness. Ka-Bar; Not a bad knife, decent steel, small size and simple type of a cord for a lanyard. 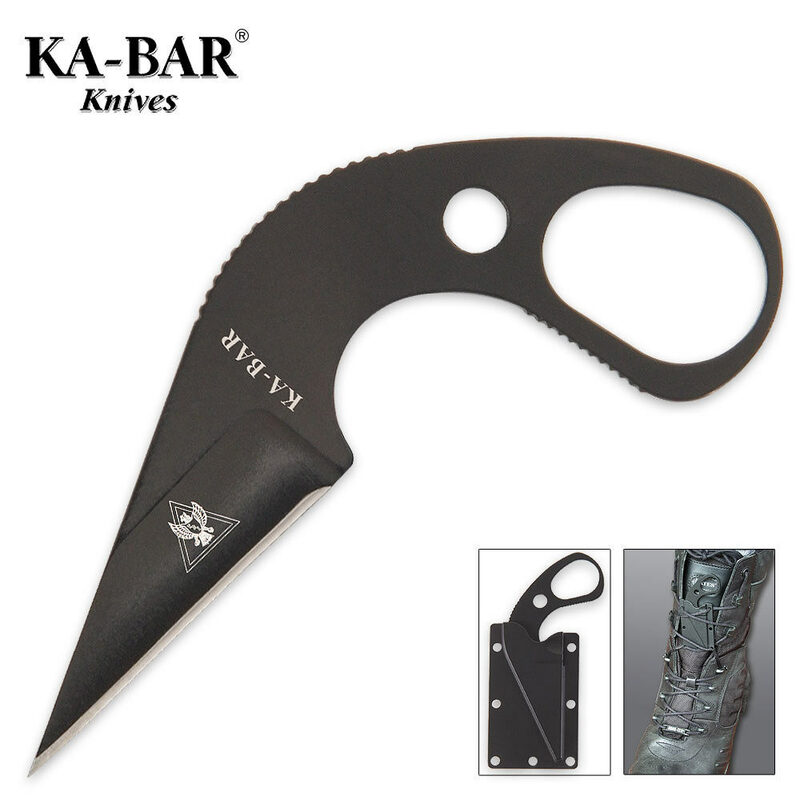 Ka-Bar is a well known company so even with the cheaper knives, they know what they're doing. Trueswords; It's a great place to buy knives, swords, blades, etc. Their shipping is great because it's always fast and on time and it's a great to use site, no problems with it. Great price I found for this knife. My experience with the knife; Lanyard seems a bit small, but that could easily be replaced. When I grab the knife out, I could wrap my hand around the handle and make a fist, and in defense, I can make some quick jabs with it and the tip is very great, without effort, it'll poke a hole. If you want, making a mini-lanyard on the edge of the knife would be great to add more grip or something to hold on to. Overall, it is a great buy, I wouldn't use it on chores, because this is a last ditch knife. Worth every penny. This little knife is just awesome. The edge is nice and the overall feel of the knife is solid. The smaller than credit card sized sheath is really great - it can be laced into a combat boot, worn around the neck, inside a 5th pocket on your jeans...Very, very versatile. If the knife weren't so good I would say the sheath would be worth it alone. I got this knife from BudK a while back and I am very happy with it. It came very sharp and stays sharp. The holder is solid and holds the knife tight. I like having it ready when I need it.